A little bit of joy at a very tragic time. Bobby Brown and wife Alicia Etheredge have named their newborn daughter Bodhi Jameson Rein Brown. 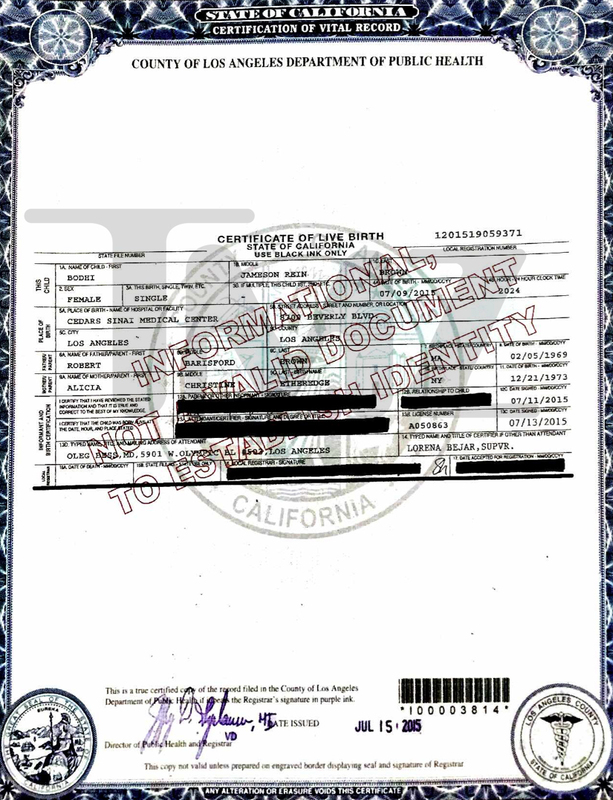 In a birth certificate obtained by TMZ, the little girl&apos;s name is shown alongside details of her place of birth at Los Angeles&apos; Cedars-Sinai hospital and the time of her birth, July 9, 2015 at 8:24 p.m.
Bodhi is a Buddhist concept of enlightenment, associated with the state of nirvana. It is translated into English as "enlightenment" or "awakened," and Brown has given his newborn daughter the calm, spiritual name amidst what is a very difficult time for the Brown family. Little Bodhi is a baby sister for the couple&apos;s firstborn son Cassius, 5. She is singer Brown&apos;s sixth child, as the 46-year-old musician has four children from previous relationships, including 22-year-old Bobbi Kristina who remains in a medically induced coma after she was found unconscious and facedown in a bathtub at her Atlanta-area condo in January of this year. At the end of June, Bobbi Kristina was moved to hospice care after her condition continued to deteriorate following nearly five months of hospital care. New dad Brown has been at Bobbi Kristina&apos;s bedside almost constantly since her accident, and admitted during a performance in April that his faith was the only thing helping him through. "You know, rough times are rough times," he said at the Soul Food Festival in Los Angeles. "Hard times are hard times. I don&apos;t know what the hell I&apos;m going through right now, but I&apos;m giving it to God and letting him deal with it." Brown&apos;s new daughter Bodhi shares her name with other famous celebrity offspring, albeit male ones! Last year, Megan Fox and Brian Austin Green named their son Bodhi, and Carly Simon and James Taylor have a grandson named Bodhi. Bodhi was also the name of Patrick Swayze&apos;s character in the hit &apos;90&apos;s movie Point Break.